MarketSaw - 3D Movies, Gaming and Technology: Spidey Update: New Trailer AND An Expanded Universe!! Spidey Update: New Trailer AND An Expanded Universe!! Hey guys - some major developments in Sony land regarding their Marvel property, Spider-man. 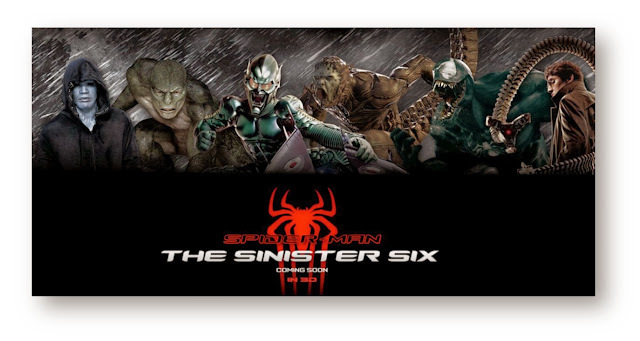 The studio has decided to expand their property exposure and Spider-man universe by developing projects for the villainous Venom as well as The Sinister Six. We also have a new international trailer for you below featuring some very funny moment from the movie (spoilers obviously!) so if you like to laugh out loud while watching the movie in the theater, then perhaps consider not watching the video. But if you're anything like me, you really don't have any choice in the matter - it's a must watch. One scene involving Emma Stone is hilarious! CULVER CITY, Calif., In a move to forge a new legacy in the story of Peter Parker on screen, Sony Pictures Entertainment, in association with Marvel Entertainment, is developing several new projects in the Spider-Man franchise, with Alex Kurtzman, Roberto Orci, Jeff Pinkner, Ed Solomon, and Drew Goddard to collaborate on overseeing the developing story over several films that will be produced by Avi Arad and Matt Tolmach, it was announced today by Doug Belgrad,president of Columbia Pictures, and Hannah Minghella, president of Production for the studio.